Who knew wedding planning could be such a dangerous job? Destination weddings are Kelsey McKenna’s specialty, but she’s not averse to picking up more business in nearby California wine country. She’s agreed to help her friend Brody Marx, a photographer, with his booth at the Wine Country Wedding Faire. But her other new gig turns out to be much more than she bargained for. Haley Bennett and Christopher Riegert, a pleasant young couple who are getting married in four weeks, need a coordinator for the day of their nuptials. Their event has been planned by high-end wedding maven Babs Norton, whose nasty assistant, Stefan Pierce, accuses Kelsey of trying to steal their clients. Kelsey soon learns that Haley’s father fired Babs. When she goes to see Babs to pick up information about what’s already been done, she finds her dead. Accused by Stefan of murdering Babs, Kelsey naturally concludes that the only way to salvage her reputation is to find the killer herself. At the stunning Napa Valley Higgins Estate winery where Haley and Christopher’s wedding is booked, CEO Lucas is delighted to work with Kelsey and hints at more partnerships in the future. His wine-making brother, Miles, by contrast, despises every aspect of the business that concerns weddings. Because Stefan continues to plague Kelsey with hostile innuendo, the police are even more suspicious of her when she finds him badly injured in the estate’s wine cave. Although she has several suspects in mind and continued snooping turns up more, she still has trouble finding proof until the killer targets her. 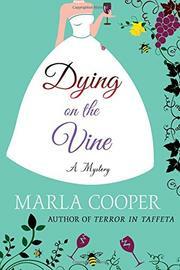 The second in this cozy series (Terror in Taffeta, 2016) offers both a behind-the-scenes look at what goes into making the perfect wedding and a surprisingly tricky mystery.